Jackie Robinson’s courage on the baseball diamond is one of the great stories of the struggle for civil rights in America, and his Hall of Fame career speaks for itself. But we no longer hear Robinson speak for himself; his death at age fifty-three in 1972 robbed America of his voice far too soon. In First Class Citizenship, Jackie Robinson comes alive on the page for the first time in decades. The scholar Michael G. Long has unearthed a remarkable trove of Robinson’s correspondence with–and personal replies from–such towering figures as Dwight Eisenhower, Richard Nixon, John F. Kennedy, Lyndon Johnson, Martin Luther King, Malcolm X, Hubert Humphrey, Nelson Rockefeller, and Barry Goldwater. These extraordinary conversations reveal the scope and depth of Robinson’s effort during the 1950s and 1960s to rid America of racism. 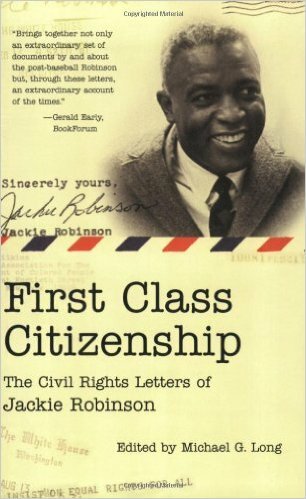 Writing eloquently and with evident passion, Robinson charted his own course, offering his support to Democrats and to Republicans, questioning the tactics of the civil rights movement, and challenging the nation’s leaders when he felt they were guilty of hypocrisy–or worse. Through his words as well as his actions, Jackie Robinson truly personified the “first class citizenship” that he considered the birthright of all Americans, whatever their race.